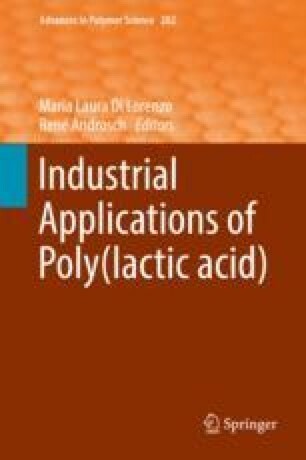 Synthetic bioabsorbable polymers, such as poly-lactic acid (PLA) and its copolymers (PLA-based polymers), have attracted a lot of attention in the medical field. With their excellent biocompatibility, mechanical properties, and tunable biodegradability, PLA-based polymers have found uses in various clinical applications, including sutures and orthopedic fixation devices (e.g. pins, plates, and screws). PLA-based polymers have also been the materials of choice for various cardiovascular applications. For example, they are extensively used as coatings for metallic drug-eluting coronary stents and in the development of the new generation of fully bioresorbable vascular scaffolds. In addition, the emergence of tissue engineering and regenerative medicine (TERM) has further extended the applications of PLA. In this chapter, we discuss the importance of PLA-based polymers as biomaterials and review the applications of this family of materials in cardiovascular applications, specifically in coronary stenting and TERM approaches to vascular grafts, heart valves, and cardiac patches. A brief insight is also given into the current market value and growth potential of PLA-based biomaterials. Dedication This paper is dedicated to the late Prof. Ronald D. Sanderson, founder of the Institute for Polymer Science (now incorporated into the Department of Chemistry and Polymer Science) at the University of Stellenbosch. The authors wish to thank the National Research Foundation of South Africa Incentive Program for Rated Researchers (CPRR) and the University of Cape Town Faculty of Health Sciences Postdoctoral Fellowship for funding and support. Potential Conflict of Interest None.